This post is late following my distraction by the Brexit vote on Friday. So here is my post on what I was reading or listening to last week. More from this book recommended at the end of the Secrets of Consulting by Gerry Weinberg. 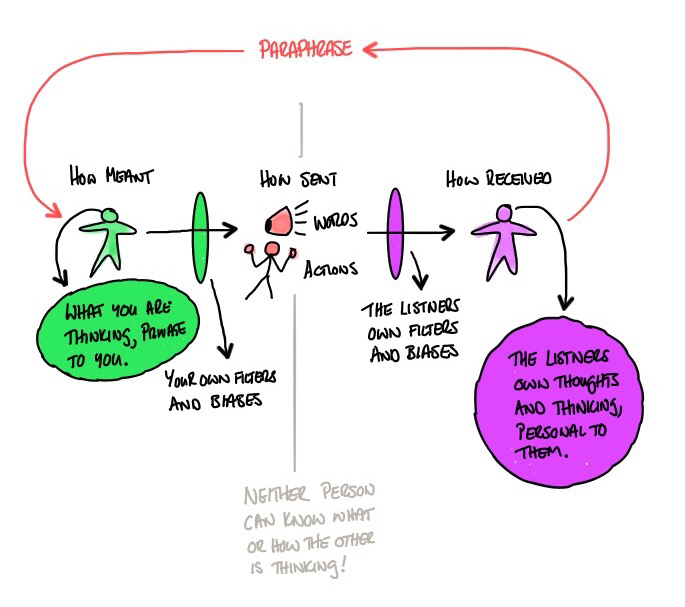 One image, prompted by a similar diagram in the book, keeps coming to mind as I think about what I have read. Below is my own version. I have seen similar diagrams before. Have a good look at the diagram and see what you make of it. The stereotype analogy that shows we don’t get it is the ‘mind reader’ argument in relationships. We expect our spouse to know what we are thinking, without realising we are communicating very little information and they are receiving even less. If we take a step back we know that there is no way someone can know what is going on in our head. When I talk about perceptions and biases I am thinking about those filters I drew above. They are influencing what goes into your minds and what comes out when you communicate. Do you feed your mind with different views to improve the quality of your own filters? Then to make it even more complicated, there is another filter distorting the message before the recipient processes what you say. While we may recognise it in ourselves, again we forget that it applies to the other person too. It is hard work trying to overcome those two filters. It is hard choosing words not loaded with different meanings, as one example. It takes effort. The result is often no better than guesswork. In my last handpicked post I discussed paraphrasing in the section discussing this book. The chapters I have been reading have all been about paraphrasing in many different forms. Paraphrasing as used in this book is the act of repeating back what you [think] you heard. You are not saying what you think, you are repeating what you believe the other person said. It is a confirmation process. It is feedback to the person communicating with you. 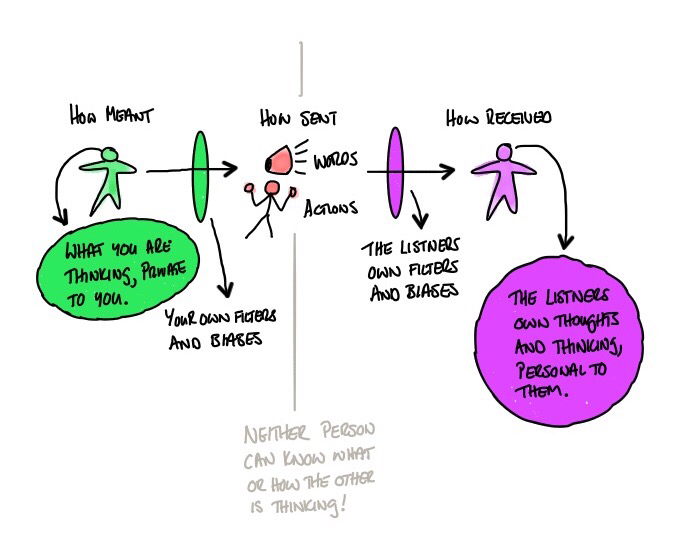 As this positive reinforcing feedback loop spins it helps you check you heard correctly, and it also helps the other person check whether the message they are sending is the one they wanted to send. Sometimes our initial comments are not what we really want to say. We are talking around the problem, or about something else entirely. By paraphrasing, by feeding back, we can help the person communicating get to what they really want to say. Psychologists sometimes speak of the “presenting problem” and the “basic problem.” A parent may come to a teacher or guidance counselor with a complaint about the way his child is being treated in school. With skillful listening, the conversation may move to topics of greater concern to the parent. The child’s treatment in school is probably a real concern, but something else, like a failing marriage or anxiety about inability to cope with the child at home, may be the most basic problem on the parent’s mind—and the one he most needs to discuss. It is a powerful mechanism for checking that the message was received. It is so simple. Favourite Highlight from the week? Coss Marte went from running a multi-million dollar drug operation to sitting in solitary confinement. And it’s here, alone in his cell, where he gets the idea for his next business: a fitness company inspired by his time behind bars. But Coss quickly learns that building a legal business comes with its own set of challenges—one being that pitching your company on stage to a bunch of investors requires a slightly different approach to selling an eight-ball outside a busy New York club. Building a startup is a tough and uncertain endeavor for any founder. But for one with a criminal history, the journey can be far more complicated. This is the second part of a two-part story. To hear about Coss’ first business and how he wound up in prison, listen to part 1 here. Alex Blumberg (@abexlumberg) and his colleagues at Gimlet know how to tell a good story. This is a good story well told. I don’t have significant takeaways from these two episodes. I simply appreciated the craftsmanship in the telling of this story. Linking to that point is the Tim Ferriss episode below with Malcolm Gladwell and the following quote where Gladwell says “sometimes my only job is not to ruin the story“. …In the late 19th century, a painting by a virtually unknown artist took England by storm:The Roll Call. But after that brilliant first effort, the artist all but disappeared. Why? This story, that spans Victorian London to modern day Australia, is about Moral licensing. The term as I now understand it refers to the permission we give ourself to be immoral, or simply not uphold our usual standard, after we have done something good. To give ourselves a pass because of a token gesture. Let’s pick an example from politics. After Barack Obama was elected the first black president in the United States some people will have felt good about themselves. Good enough to say they are not racist, they voted for Obama. How could they be racist? But then go home and their actions suggest differently. The act of voting for Obama gives themselves permission to be guilt free elsewhere. Or having a cake because you went to gym. Going to gym gives you the license to slip somwhere else. I have heard the phrase before but not thought about it that much. I don’t think I have ever used it in a conversation. I enjoyed this first podcast in this series. It is interesting and informative, and current. He is alluding through out to the prospect of Hillary Clinton being elected as the first female president of the US and the challenges she may face, and how we should see those challenges. Or how we should think about our own behaviours and the way we perceive her effectiveness in that role, should she win. Malcolm Gladwell (@gladwell) is the author of five New York Times bestsellers — The Tipping Point, Blink, Outliers, What the Dog Saw, and David and Goliath. He has been named one of the 100 most influential people by TIME magazine and one of the Foreign Policy’s Top Global Thinkers. He has explored how ideas spread in the Tipping Point, decision making in Blink, the roots of success in Outliers, and the advantages of disadvantages in his latest book David and Goliath. In his latest podcast project, Revisionist History, Gladwell examines the way the passage of time changes and enlightens our understanding of the world around us. This was a great conversation. One of my favourite from Tim. The first part in particular is Tim doing what he does best. They discuss the process of writing itself. It is interesting hearing how Malcolm Gladwell thinks about his work and how he views his craft. He makes the point that writing is only one small part of the process, a very small part. The larger part of the process is thinking about what you are going to write and researching the topics. I enjoy Malcolm Gladwell’s books. I know he has his critics. Everyone does. But I believe he fills an important role that cannot be left to academics alone. His books get their readers interested in topics, and in learning more. That in itself is valuable. I think of a spectrum from ignorant to informed. His critics would be more towards the informed side of that spectrum, on the right. The vast majority of the population is on the left hand side. This is why education is so important. We need to move more and more people to the right. School is dull unless you are lucky to have a particularly good teacher. Not many pupils can make the connection between what they are learning in class and the wider world. That is where someone like Gladwell becomes important. It is authors like him that helped me realise learning can be fun. Reading can be both instructional and enjoyable. And off the back of that I read more and learn more. I don’t think any book can be seen in isolation. It must be seen as one step along a journey. If you are interested you will want to learn more. It all goes into those filters I talked about above. It broadens your horizon. I want to mention one other part of the conversation that links with the recent theme on quality questions. They get into a conversation about how he became inquisitive. Gladwell talks about how his father was particularly good at asking ‘dumb questions’. He was secure enough in his own knowledge that he wasn’t afraid of asking ‘dumb’ questions if he didn’t know the answers. We can all do this. We can all ask the simple, dumb, question from time to time. Let’s not assume too much. Many times someone else doesn’t know. And sometimes even the person talking or teaching might not know. A great article about how words being dissappearing from our vocabulary. As these words leave our lexicon it limits our ability to talk about complex issues of morality and ethics. Food for thought. I am learning a lot from Copywriting. If you are interested in how a good web page is structured then read this. While Copywriting earns its money in advertising and sales I am seeing how useful it can be at work. I am fascinated by outdated management theory that just won’t go. This article discusses this point, and the origins of ‘scientific management’ that underpins what almost all of us experience in our working lives. But simplifying products is hard — when you’re adapting to a known category, or because you’re over-relying on what customers tell you to do. To get better at simplifying your products, go deeper to understand the “why” from your customers; be skeptical and ask critical questions; and have a singular purpose for your product or feature. A great article on simplification. This is about understanding the essence of your product and removing the unnecessary.